Add Pan & Zoom effects to Video with Ease. 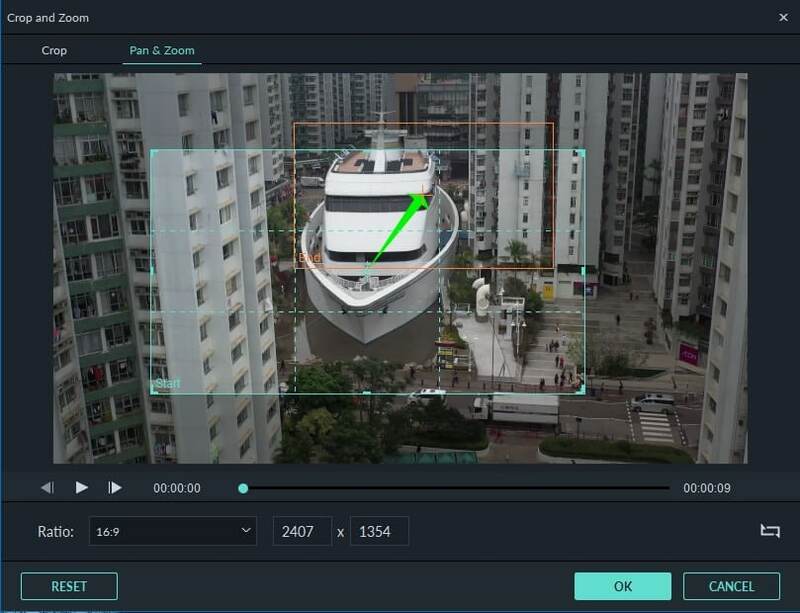 Want to zoom in video during your favorite scenes like Mark, after the video has been recorded and shot? This article will show you how to zoom in video and make a Ken Burns Effect by cropping video and the Pan& Zoom effects. For this demo, we'll use our own video zoomer Wondershare Filmora9 (Windows 7/8/10 supported). 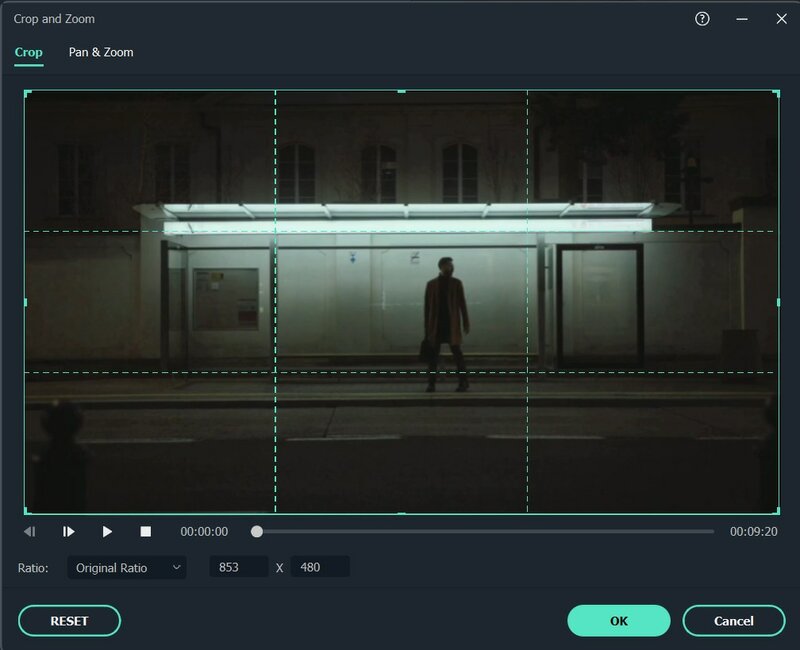 It's a powerful video editor that comes complete with all common video editing tools, along with an array of video effects, transitions, titles and various options to share your creations. There are two ways to import video files to zoom. Option 1 is to click "Import" on the primary windows and select files from your computer. Option 2 is to directly drag and drop files to the media library. Then, you'll see your videos on the screen. Any further editing won't change your original files. Next, drag videos from the media library to the video track on Timeline. Right-click the video need to zoom in and then select Crop and Zoom from the sub-menu. Or you can select the video in the timeline and click on the Crop and Zoom icon in the toolbar to enter the Crop and Zoom interface. You'll find a "Crop" button in the middle of screen. Click it to open the editing window to zoom in videos by cropping unnecessary part. To help you crop and zoom in video quickly and easily, you can manually select the crop area to make a zoom effect in the original video, or keep the zoom in area in 16:9, 4:3, 9:16 or 1:1 aspect radio. Drag the marquee to the target position in the original preview window. Note that you should select a corresponding aspect radio when exporting if you have chosen a radio here. Otherwise, black bar will be added. For example, you've zoomed in on video to 16:9, so you need to choose a Resolution in "Advanced settings" like 480*272 or 1280*720 (1.78:1). Pan and zoom effects, which are famous as Ken Burns effects too, will make the video or image slowly zoom in on the specific subjects and pan from one to another. You will see a start and an end rectangle on the window. The default start and end settings will zoom in the video slowly and slightly to the center. To change the section of the video that appears at the start of the effect, select the Start rectangle to adjust the crop size and drag it on the window to get target position. To change the section of the video that appears at the end of the pan & zoom effect, select the End rectangle to adjust the crop size and drag it on the window to set its position. Click the Play button to check the Pan & Zoom effect in the video and you can also exchange the Start and End areas by clicking the Swap button in the bottom left corner. And click the OK button to save the Pan and Zoom effect. Always preview your video before output your video. When the preview is good, click Export and a dialog as below will appear. 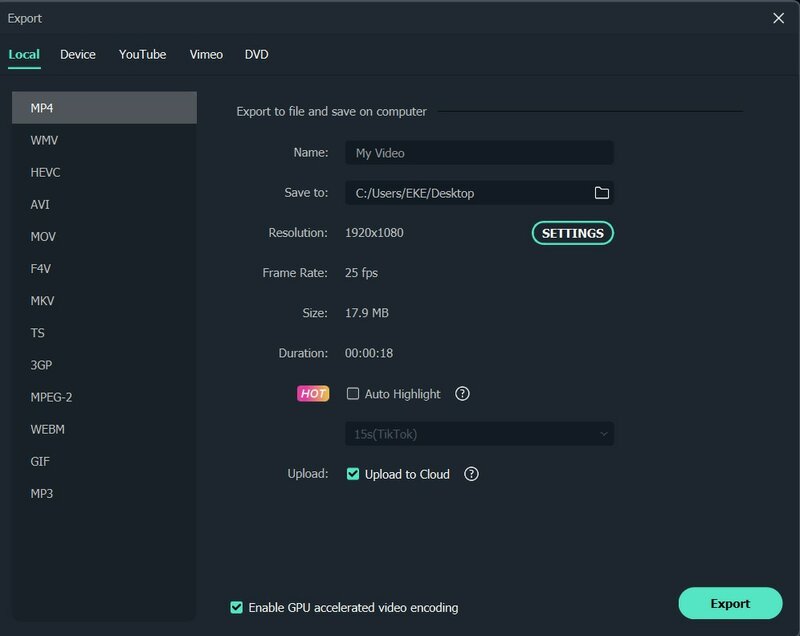 Here you can export video in any popular formats on the local computer by choosing "Format". If you want to play video creation on iPod, iPhone, iPad, click "Device" and select the thumbnail of your devices. You can also directly upload your zoom-in videos to YouTube and Vimeo or burn to DVD discs for playing on TV using a DVD Player. iPhone doesn't come with the optical zoom feature. So you can't natively zoom in / zoom out iPhone video. However, with the help with application like Wondershare Filmora9, you can effortlessly zoom in iPhone videos. As described in this article, you can import iPhone 4 video to Wondershare Filmora9 and zoom in video at your pleasure. Make sure the aspect ratio of the zoom-in video is the same with that of the selected output format. Note that the quality of zoom-in video depends on the chosen output format to some extent. For example, you have selected small dimensions, but output as large dimensions of video, the quality would not be good. In such case, smaller output dimensions are recommended. Besides the Pan & zoom effect, Filmora9 provides much more features. Watch the video below to check how to edit video with Filmora. okay but how do you zoom out? As in, Get the footage to be surrounded by black or another color or whatever. The pip editor does basic things but its not customizable as you're stuck with the presets, anyway to do this kind of thing manually? It's only available for elements and stuff like that not actual video zooming animation. What about the zoom in MOTION? (This is a zoomed in function WITHOUT the motion). 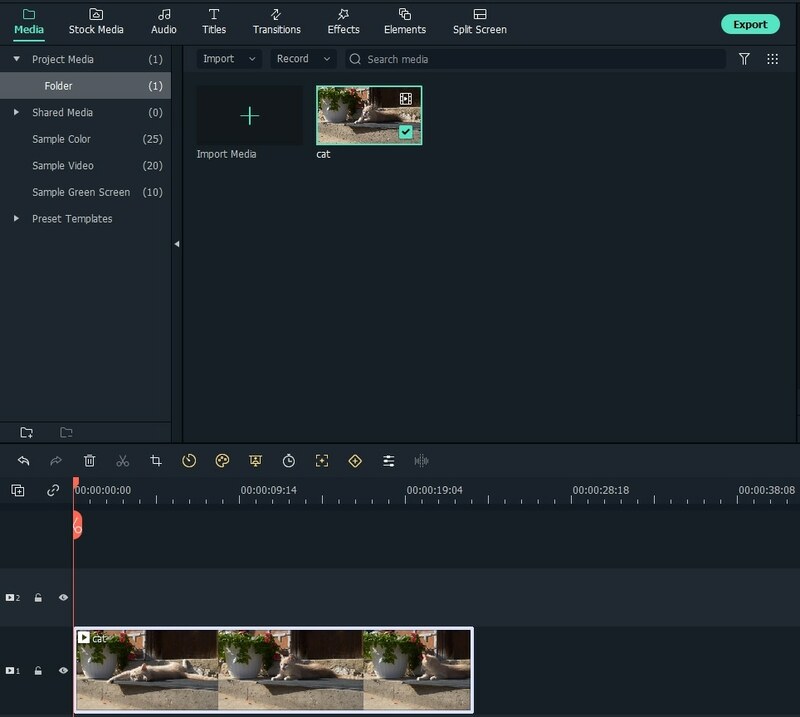 Any plans on implementing the zoom in motion function in Filmora? It´s a big drawback Filmora lacking that feature and it´s a reason I´m starting to look for substitutes to Filmora (wich elsewise is a nice and userfriendly film editor). now, how is that watermark will make me but this software? i needed this crop function now and i will probably never use it again and my video might have use filmora signiture in right bottom corner. instead, i will just go look for a different program that does the same thing.